Trump and the Russians: Collusion or Sowing Discord? 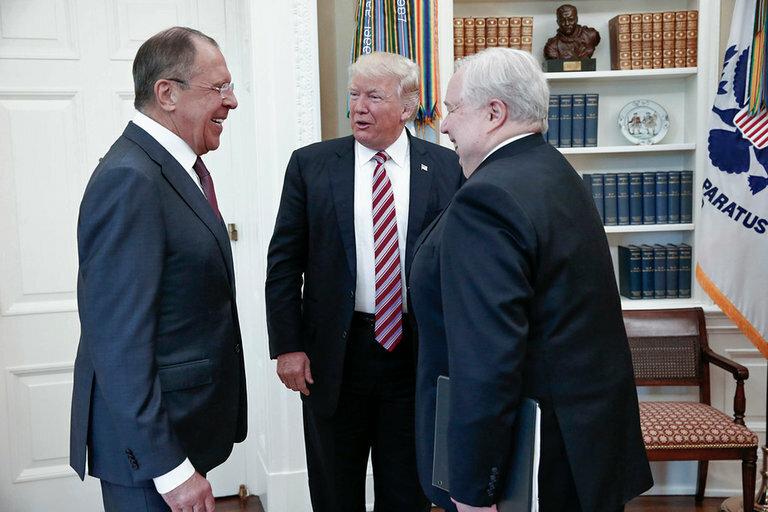 President Donald J. Trump grins widely with the Russians in private. Did the Trump campaign collude with Russia? Did Russia’s action require collusion? And if not, might the Russians have had ulterior motives for the many open and clandestine meetings that occurred between Russia’s representatives and those of the campaign? As the U.S. Intelligence Community announced last winter, Russian intelligence agencies actively interfered in the U.S. electoral process in 2016 to the advantage of Donald Trump. The impact of this interference on the outcome is difficult to determine. Some are quick to point out that Russia did not successfully tamper with the actual voting or vote-counting processes, which of course is a good thing. Harder to assess is the impact of various Russia-generated scandals on voters’ perceptions and attitudes, whether Russia’s actions changed people’s minds or made certain groups of voters more or less likely to turn out on Election Day. While the fact of outside interference is a central issue, much of the debate has focused on whether the Trump campaign actively colluded with that interference. Trump and his associates—evidently, and perhaps understandably, focused on the consequences for themselves—seem to see the issue solely in terms of an attempt to undermine the legitimacy of his presidency. I do not mean to belittle the issue of collusion, it is indeed important, but we should not forget that the fact of interference is in itself a vital issue worthy of serious investigation regardless of whether collusion occurred. In a sense, the most important collusion came not from the Trump campaign, but from the press and the pundits, which took every morsel of banality or gossip that was dished out by Russian hackers and treated it as a scandal revealed. As Joshua Foust, a former intelligence analyst, noted after reviewing the hacked DNC emails: “Moreover, these leaks don’t actually serve any public interest: they aren’t exposing corruption or illegal conduct. They are just gossip: who secretly hates whom, can-you-believe-this-brainstorm, stuff like that.” The biggest “scandal” to come out of the DNC hack was a couple of dirty tricks proposed by angry staffers (talking outside their areas of responsibility) that were never acted upon; and this was presented as proof that the primary-electoral process was rigged. With regard to collusion by the Trump team, what seems most striking is that most of the Russians’ actions did not really require anyone’s cooperation (beyond that of the media). * The Russians stole emails and other documents from the DNC, DCCC, and Podesta archives; they gave them to WikiLeaks; no help needed, thank you. Yet we do have some evidence that (a) at least some Trump people were willing, even eager, to collude and (b) that a number of meetings were held between several Trump people and several Russian nationals who either worked for the Russian government or had past connections with it. Regarding the eagerness, some Trump campaign aides—central ones, such as Michael Flynn, and peripheral one, such as Carter Page—were known to have pro-Russian sympathies. In July 2016, Trump, who generally spoke favorably of Russia while denying that it was helping him, publically called on the Russians to find and release Hillary Clinton’s deleted emails. (A Trump aide later said it was a joke.) Beyond that, we have Donald Trump, Jr.’s email chain from June 2016 in which he responded “if it’s what you say I love it” when offered “official documents and information that would incriminate Hillary,” which was being provided as “part of Russia and its government’s support of Mr. Trump.” We also have the less direct evidence from Peter W. Smith, a Republican donor, fund-raiser, and activist, who claimed a close connection to Trump’s foreign policy adviser Michael Flynn, knew a lot of inside information about the Trump campaign, and established an independent corporation to support the Trump campaign from the outside. Smith actively sought Hillary Clinton’s deleted emails, which he assumed the Russians must have hacked and would make available if asked. He hired his own hackers to make the connection with the Russians. It should be noted, though, that we do not know for sure that Smith’s activities were authorized by the Trump campaign. The fact that Smith was seeking a connection with Russia as late as September 2016 does not support the notion that the campaign had already been colluding with Russia since at least June (unless Smith was not considered important enough to tell and was acting on his own, which is certainly possible). So, it is clear that at least some Trump people were willing to collude, but we still lack solid evidence that actual collusion occurred. If collusion was not necessary, then why did so many Russians hold personal meetings with so many Trump associates? Why would they expose themselves in this way? It is certainly possible that active collusion with a campaign might make the interference more effective, or that letting Trump know how much help Russia had provided (and how compromised his campaign had become) might make him more willing to do Russia favors in the future. These would in fact be consistent with past Russian intelligence practices. Yet I would like to offer an alternative possibility. The Russians might have been purposely planting seeds of suspicion in order to sow chaos and discord in U.S. politics after the election. Remember that, according to the U.S. Intelligence Community’s assessment, the Russians’ original purpose was “to undermine faith in the US democratic process, denigrate Secretary Clinton, and harm her electability and potential presidency.” Only with time were their goals seen as expanding to include “a clear preference for President-elect Trump.”** Now this preference for Trump could mean that they liked him, which seems to be the conclusion drawn by Trump (who appears to see personal relationships as the be-all and end-all of international politics). It could also simply be a function of the fact that he was the alternative to Clinton, whom Putin clearly did not like. Finally, depending on your view of Trump, his victory could be seen as a means for achieving the original purpose: undermining American government, especially if his victory was compromised. What do we mean by compromised? Is there evidence that the Russians sought to taint a possible Trump victory? On the one hand, you have the Russian ambassador, Sergei Kislyak, constantly showing up at all sorts of public and private meetings with Trump associates, often with little evident reason for him to be there. As evidence of secret, or at least private, meetings emerges, however, we see much more. • Ambassador Kislyak recommends that Jared Kushner meet with banker Sergei Gorkov. Presumably, he does not mention that the bank in question is under U.S. sanctions and that Gorkov’s résumé proudly lists the fact that he’s a graduate of the FSB (Secret Police and Intelligence) Academy. 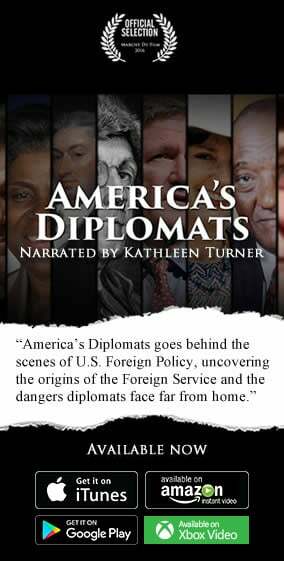 • Ambassador Kislyak holds conversations with Michael Flynn—while Obama is still president and formulating sanctions against Russia—about undermining Obama’s policies toward Russia on a phone that the ambassador must know is bugged. • Foreign Minister Sergei Lavrov brings an “official photographer” who is also a photojournalist to a meeting with the president from which U.S. journalists have been excluded and then immediately publishes photos of Trump grinning widely with the Russians in private. • The Russians have an email sent to Donald Trump, Jr., that openly says the Russian government supports the Trump campaign and wants to give it stolen documents that will incriminate Trump’s opponent. Who does that! It’s like James Bond knocking on the door and saying, “Excuse me, but I’m from British intelligence and I’m here on a secret mission.” Even if their purpose was to test the campaign’s receptiveness to collusion, it seems they could have thought of something a little subtler, something that would have left less physical evidence of said collusion. Then, when Trump wins the election, you might expect the Russians to support their new, powerful ally at the pinnacle of the U.S. government. What happens? • Two days after the election, Deputy Foreign Minister Sergei Ryabkov announces that Russian officials have been in contact with Trump’s immediate entourage throughout the campaign. • When news of Kushner’s meeting with Gorkov emerges, Gorkov, contradicting Kushner, says they were discussing private business, implicating Kushner in a possible violation of U.S. law. • Rinat Akhmetshin, a former Soviet counterintelligence operative and current pro-Russian lobbyist in Washington, volunteers that he, too, was at the Veselnitskaya meeting and that she did offer the younger Trump information on Clinton. If the Trump team was colluding with the Russians, the Russians do not appear to be very grateful. It is possible that the Russians are showing their dissatisfaction with Trump for his failure to lift sanctions or otherwise improve the state of U.S.-Russian relations, although Ryabkov’s statement preceded any opportunity Trump might have had to do that. I suppose it is also possible that the Russians have real dirt on Trump and that these little gestures are just reminders of what they could reveal if he does not come through soon. I posit the possibility, however, that their purpose all along has been to undermine the U.S. government, to sow chaos and discord, to inflame suspicions, to turn American against American, and to erode the United States’ capacity to do anything at all, either at home or abroad, regardless of whether the Trump team actually collaborated or not. If so, they certainly found the perfect instrument in Donald J. Trump. *A recent article posits that Jared Kushner’s digital team may have given the Russians information on which constituencies to target when distributing false or damaging stories about Hillary Clinton during the late stages of the campaign. While possible, this is still not proven. Even if Kushner’s database was the only possible source of such information, Russian hackers have shown some ability to acquire information from databases without having to ask for it. **Of course, it would also be in keeping with past Russian practice if they had a range of possible objectives—ranging from minimum to maximum goals—depending on the receptiveness of the environment encountered. Scott C. Monje, Ph.D., is senior editor of the Encyclopedia Americana (Grolier Online) and author of The Central Intelligence Agency: A Documentary History. He has taught classes on international, comparative, and U.S. politics at Rutgers University, New York University (SCPS), and Purchase College, SUNY.